Home Care is a growing industry and it goes well beyond receiving health care in the home. 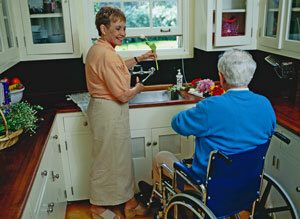 Those living with disabilities have known about home care for a long time. They typically relied on family caregivers to help them with activities of daily living. Today, people without disabilities are choosing to stay in their home longer and receive help in their home if necessary. Some may need help with medication and some may simply need companionship or help with chores. Part of “aging in place” is preparing your home with “universal design” in mind. This view on home design and accessibility promotes usability by all abilities while maintaining a normal home style. This can include barrier free design techniques like no-curb shower access, extra-wide doorways and ADA-compliant plumbing. The idea is to design without barriers to anyone without compromising on the aesthetics. This is ideal if you are building a new home, but what about remodeling your existing home? Many barrier-free ideas are simple and do not cost much. Simply removing clutter and creating wide, safe walkways through your home is a start. Other simple changes include more ergonomic door handles or affixing loose rugs. But what about those who suffer from limited mobility or physical handicaps that prevent them from using the stairs or getting up easily from furniture? Home medical devices have come along way. Supplies can be delivered to your home and administered by yourself, a family member or a home care aide. They have recliner chairs that help you stand up. They have attachments for your bed to help you get yourself up. These are everyday devices that make life a little easier as you age. However, more sophisticated medical devices for the home have not gone through the same improvement process. In the past, the only way to move a patient with limited mobility was with a floor-based Hoyer lift. These are simple tools that are anything but simple to use. Patented over sixty years ago, it was the standard for many years and still remains as the only lift that Medicare will pay for. 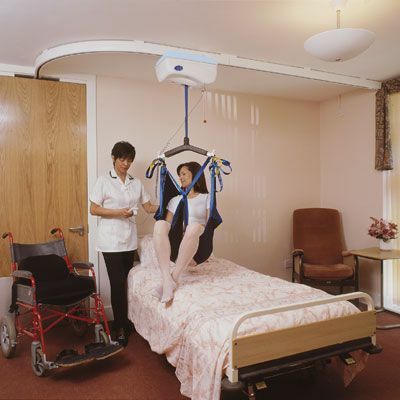 These lifts are used in hospitals and skilled nursing facilities with reasonable success, although they are being rapidly replaced by ceiling track lift systems. In the home, these systems are very difficult to use and can be dangerous if not properly operated. They require two aides to properly transfer a patient and the limited area of a typical bedroom can limit the proper use of the lift. Ceiling track lifts are a more modern approach to patient transfer. Hospitals and skilled nursing facilities are able to install small ceiling track pieces in each room and share a portable lift motor between rooms as needed. They are able to save money by sharing resources between rooms. In the home, installing ceiling tracks is a very expensive process. A practical and affordable solution to this has been the development of a freestanding overhead track lift system. These feature all the advantages of an overhead lift without the costs of a ceiling track system. Traxx Mobility Systems manufactures the TITAN 500, a freestanding overhead patient lift. The system includes an aluminum frame and overhead track, a rechargeable electric lift motor, a four-point lift bar, hand-held remote control and machine-washable sling. The system comes partially assembled and is fully assembled by two adults in twenty minutes. It does not attach to the home in any way and can be easily be moved if necessary. The most important aspect of an freestanding overhead patient lift is that it allows a single caregiver to transfer a patient. This can be accomplished in under five minutes without fear of injury. The lift motor raises and lowers the patient at the press of a button. The caregiver simply has to gently push the patient across the overhead beam to transfer. This provides for a much more stable and dignified lift experience for the patient with the caregiver close at hand throughout the entire transfer. For more information, visit our website, find us on Facebook and watch our YouTube channel. If you are living with limited mobility, you know the difficulties in performing the activities of daily living. You have made simple changes to your home to create barrier free accessibility to ease your movement. Big changes may have occurred as well. Perhaps you moved your bedroom to the first floor to avoid stairs or you have claimed the living room as your new bedroom to accommodate your medical equipment. These are examples of Universal Design, ideas that create environments that are inherently accessible to older people and people with and without disabilities. Staying at home as you age has the advantage of keeping you in a familiar place where you know your neighbors and the community. There is a wide range of home care services that can help you maintain your independence within the comfort of your own home, from in home care to day care. You may also be able to make home repairs or modifications to make your life easier and safer, such as installing a wheelchair ramp, bathtub railings, or emergency response system. A patient lift is a crucial part of of this equation. There are several types of lifts available to those suffering from limited mobility. The traditional, floor-based, manually-operated Hoyer lift is the most common. There are also electric Hoyer lifts and ceiling track lifts like hospitals use. The prices of these lifts vary from several hundred dollars to several thousands of dollars. 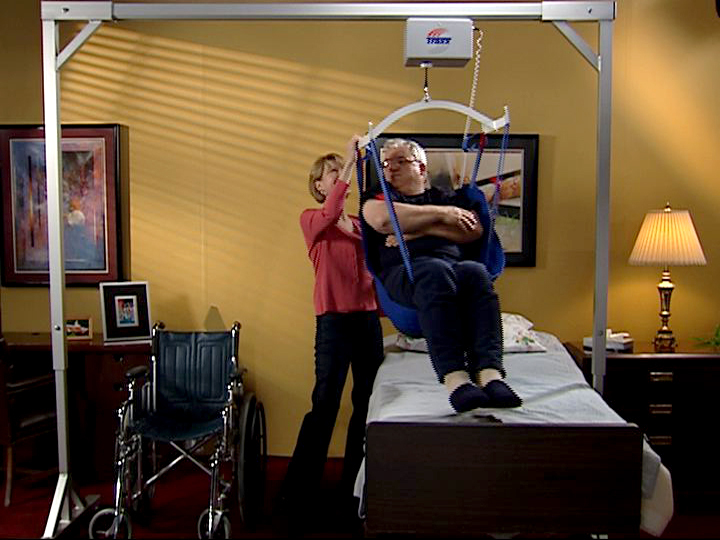 A new type of lift on the market is a hybrid of the ceiling track lifts that are very easy to use, require little effort on the caregiver, and can be set-up without attaching to the structure in any way. 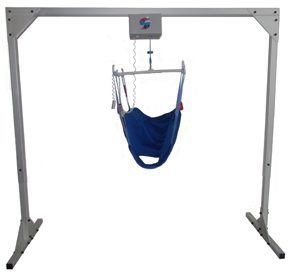 These types of lifts are called freestanding overhead patient lifts and costs about the same as an electric Hoyer lift. Traxx Mobility Systems manufactures the TITAN 500 Freestanding Overhead Patient Lift. This innovative lift system includes everything you need to maintain your independence for one low price. The Lift Package includes the aluminum frame, rechargeable electric lift motor, remote control, battery charger and even includes a sling! Loved ones can remain at home. Affordable – The whole 8 foot system retails for under $4000! At-home care is a great option for caregivers and their loved ones following post-acute medical issues. For the patient recently discharged after an illness or one who is coming home following rehabilitation services, home care can create the safety net needed during the recovery time. The article discusses how older adults can successfully transition from post-acute care following an illness or accident to more desirable home care. This blog is for informational purposes only, and is not intended to be a substitute for professional medical advice, diagnosis, or treatment. Always seek the advice of your physician or other qualified health provider with any questions you may have regarding your health or medical needs. 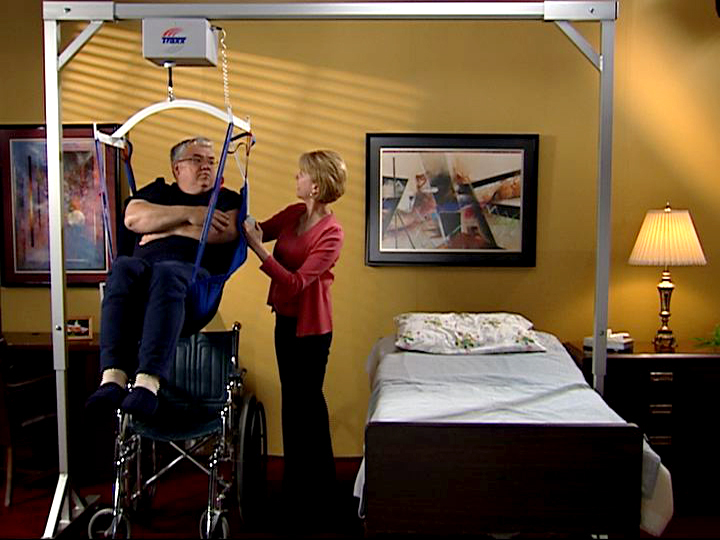 The Traxx Mobility Systems Titan 500 is a freestanding overhead patient lift for those living with limited mobility. The Titan 500, a ceiling track lift alternative, boasts many advantages over the standard floor-based lifts on the market. A single caregiver can safely transfer a patient. A floor-based lift requires two caregivers to safely move a patient. No physical exertion required on the part of the caregiver. A floor-based lift must be physically moved and repositioned, with the patient in it, requiring caregivers to put themselves at risk for injury. The transfer experience is calming and dignified. The caregiver is within arms reach of the patient throughout the whole transfer process. 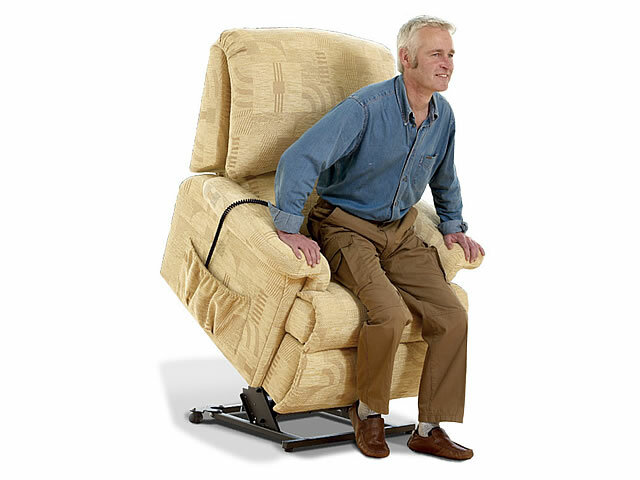 Floor-based lifts require one caregiver to manually move the product with the patient in it while the other caregiver, if available, “spots” the patient to make sure the lift doesn’t tip over. The freestanding overhead lift is out of the way within the bedroom. The frame fits in any bedroom and is ready to go at any time. Floor-based lifts are often in the way when not in use, must be pushed under the bed to lift the patient from bed, and then repositioned to lower the patient. Furniture may need to be moved or removed from the bedroom to use floor-based lifts. These are some of the benefits a freestanding overhead patient lift has over the floor-based patient lifts. When considering a lift solution for your loved one, be sure to look at all the options. While Medicare may pay for a manual, floor-based lift, is it the best option for your situation? See how the Titan 500 can make life easier for you and your loved one. Ditch the floor lift. For more information on the Titan 500, visit our website, watch ourYouTube channel or find us on Facebook!